We all have some recreational activity that we like, Some of us like to go trekking, camping sailing but many people like to be a little more adventurous. One exciting way of enjoying the water is paddle boarding. 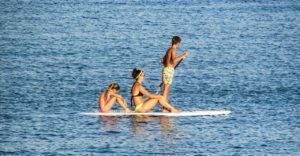 You can check out this website if you want to see some detailed information on the many health benefits of paddle boarding. If you are interested in taking up this pastime, keep on reading. It is an activity that involves standing or sitting on a board that looks similar to a surfboard, but you also use a paddle to help you row. It is a very addictive pastime and many people who take it up continue to do it on a regular basis. 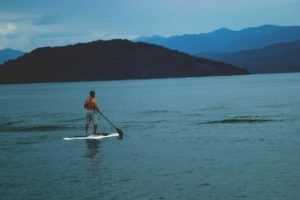 Paddle boarding can be done on the Ocean, a lake, or at a river and if you want to give it a try, you should start on a body of water that does not have waves like a lake. It requires a lot of balance, but once you have done it a few times, you will learn how to handle yourself. Many people even practice yoga on these boards, and they say it is very relaxing and effective. You will need to get yourself a board and the paddle if you want to start doing this. There are two types of boards. Let us look at their features. These are the most popular ones that are ideal for use on the Ocean as they handle waves well and are faster. They will require some getting used to, and you should wear a life vest in case you are a beginner. Since they are large, you must have a vehicle that you can use to transport them to the place you will use them. This model is easy to transport and won’t take much space in storage. Many people say that they are perfect for performing yoga on the water. They will, however, require an air pump in order to be inflated when you want to use them. They are also less costly than the hard ones. Who is this sport for? Anyone can take up this activity as it is very enjoyable and not an extreme sport. It can get a little extreme if you start using the boards to ride waves. Try paddle boarding and you will not turn back.